Beds provided with bookcase-frame or bookcase-modules under the base, ideal for those who need more space. 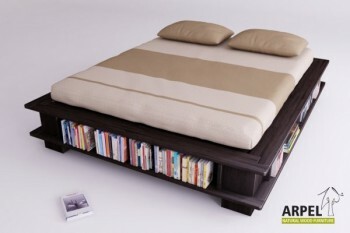 Some beds can be accessorized with openable bases and turn into bookcase-containers. The eco-friendly bookcase bed is made up of solid laminated beechwood, it has an 18 cm large frame with rounded frontal corners. The 35 cm high space in the bedframe serves as a bookshelf for books up to 25 cm of height; other heights are also available (40-45cm). In this version the bookcase is present on all sides. Slats are included in the price. The bedframe at the head of the bed of this model is reduced by 10 cm. The bookcase is present only on 3 sides and the frame is 18 cm large with rounded frontal corners. The 35 cm high bookshelf can contain books with a maximum height of 25 cm; other bookshelf heights are also available (40-45cm). Slats are included in the price.